Dublin is still working hard as a guide dog in Arizona and not likely to retire anytime soon. 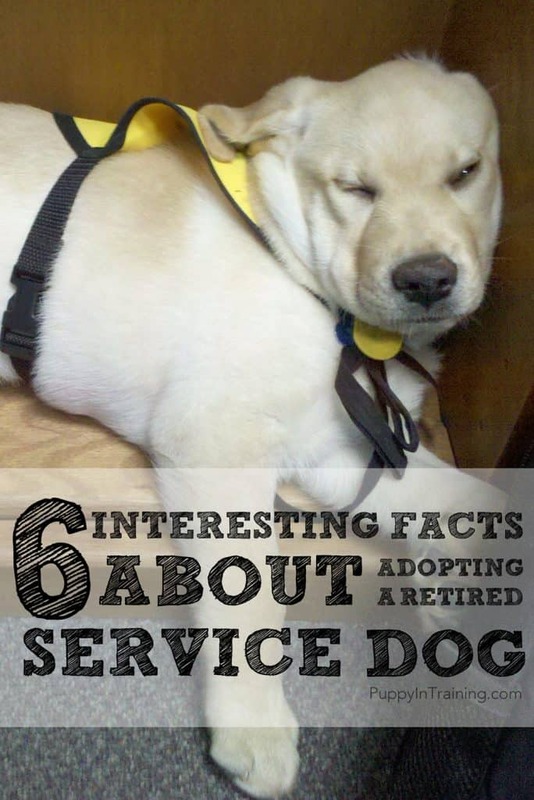 I thought I knew a lot about adopting career change and retired service dogs. That was until I started researching my ultimate list of service dog schools with adoption programs. Before I started researching I had an understanding of about a half dozen schools and their adoption programs. Fast forward and after researching over 100 organizations I found a few interesting facts. Most of the adoption pages on the service and guide dog websites are very similar including most likely reasons for career change: health and temperament issues, breeds: Labs and Goldens, length of waiting lists: a year or longer, etc. $4,000 was the highest price for a retired service dog. On the other hand several organizations did not require a payment for a retired service dog, but donations were encouraged/appreciated. The longest waiting list for a career change dog was 6 years. Most programs said to be prepared to wait a year or longer for one of their dogs. At the Seeing Eye you can reduce your wait time by giving a gift of $25,000 or more! – I’d guess this is probably true for most of the organizations on our ultimate list. I wish I had that kind of cash to share with my favorite guide and service dog organizations. The Service Dog Project uses exclusively Great Danes in their program. Most organizations use Labrador Retriever or Golden Retrievers in their program, but the Service Dog Project uses the giant breed, Great Danes. Unfortunately, I couldn’t find information on an adoption program for their group. Pilot Dogs Inc. regularly uses seven breeds in their guide dog program: Labrador Retrievers, Golden Retrievers, German Shepherd, Boxer, Doberman Pinscher, Standard Poodle, and Vizsla. We regularly see Labs and Goldens on these lists, but Dobermans, Boxers, and Vizsla’s are not as common to see as guide dogs. Those are the facts! What do you think? I must say I find the above list very interesting. Are you affiliated with a service or guide dog school? Do you have any interesting facts you’d like to add to this list? I’d love to hear about your experiences in the comment section below. These are some great facts!! I would expect a privilege too, if I donated 25k! Haha!! Yep! 25K is a pretty penny! I think most programs would jump you up to the top of the list with a donation like that. Wow! A retired police K9 German Shepherd. I bet it’s not easy to get on the wait list for a retired police K9. I wouldn’t mind reading an article about how one would go about adopting a retired K9 if anyone has knowledge on the subject. I have a relative who is currently looking into this but I think she’s a little intimidated by the waiting list length! Have your relative take a look at our first post on how to adopt a retired service dog. We give some tips on how to move your name up the wait list.